OK, yes, it is the peak of summer, but this is Patagonia. Unfortunately, you can’t tell in the picture how windy it is! Not only is it high-latitude (53-54 degrees where I was, in and south of Punta Arenas – roughly equivalent to the latitude of Haida Gwaii/Queen Charlotte Islands). But in addition, the plate tectonic accident that has placed Antarctica symmetrically over the south pole (for now, anyway) means that, unlike in the northern hemisphere, the winds that swirl around the globe in the latitudes 50s, 60s and 70s are unimpeded by any continental mass here in the south. The south tip of South America is the first point of land that juts down and intercepts these winds (check it out on a globe – South America’s southern tip is something like 1000 km further south than either Australia or South Africa. Sorry I don’t have a globe on hand to verify my figures, but something like that). That’s why southern Patagonia is so windy, and why the ocean currents are so treacherous. So, I have been offline for a while. Over the next two weeks I’ll catch y’all up on the interesting places I have been to. I am officially down here to report on an adventure race, Xtremo6000, which is part of the Adventure Racing World Series and which will take place later this week in northern Argentina. But I decided to take advantage of being flown this close to Patagonia by grasping the opportunity and heading down to visit my dear friends in Chilean Patagonia. I met the Cáceres Murrie family back in 2004 – they run a wilderness lodge at Cabo San Isidro lighthouse, the southernmost inhabited point of the American continent, on the edge of Magellan Strait. 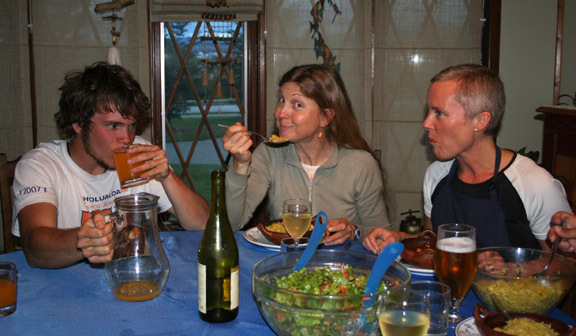 The Patagonia Expedition Race finished there a few years back – I was reporting on that race and, while waiting for the teams to come in, we all became friends. 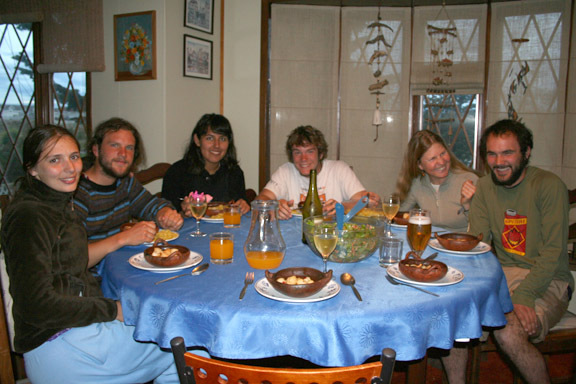 In particular, Benjamín and I really hit it off (he was 14 at the time), with our common interests in learning about gathering wild foods and trying to figure out how to make serviceable objects from found items, e.g. making urchin-catching spears (erizeros in Spanish – we don’t have a word for them in English) and weaving baskets out of the native reed junquillo. Benjamín is now 20, and going into his third year in marine biology. (He’s also an amazing swimmer… more about than in an upcoming post). My visit coincided with his summer break, so we headed out to the lighthouse (or faro) with plans to hike to Cabo Froward: the southermost point on the American continent. Benjamín had some guiding obligations first (tourists who had come to hike and kayak from the faro) so I hung out with him, enjoying the hiking and kayaking and doing some photography. 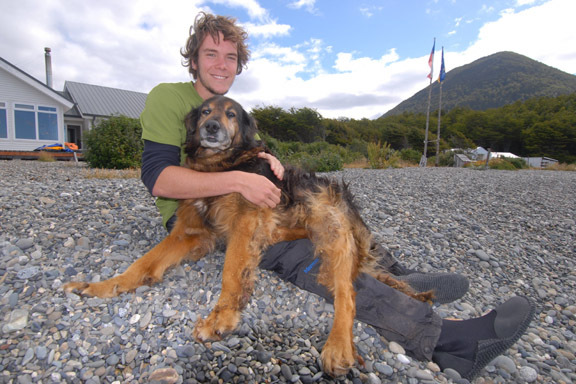 By the time he had finished up his guiding obligations, Benja had a friend arriving back home in Punta Arenas (another champion swimmer, more about her coming up too). So we did our 4-day hike to Froward in just two days (i.e. 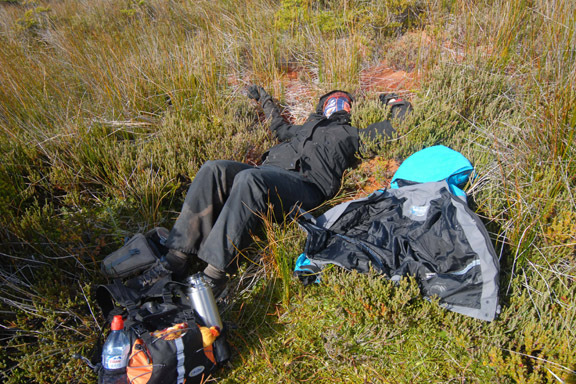 60 km of rough terrain: irregular coastal rock shelves, wet and spongy peat bog, and steep slippery rainforest trails in less than 36 hours!… carrying 4 days of food with us). There were 4 river crossings along the way – and we hit 3 of the 4 at high tide, forcing me to swim (Benja is used to cold water; I am not!). Out backpacks were stuffed into big garbage bags – as heavy as they seem, they still float!. We lucked out with the two sunniest days of my whole visit for the trek, and by the next morning we were back in Punta Arenas. (More on that coming up too… especially the dolphins leaping joyously at the bow of the zodiac). So I’ll be posting more about the whole trip over the coming weeks – photos and words both. But the summary is…. a few days in Buenos Aires, overcoming the jetlag while taking in the tango scene, then 2nd a half weeks in the far south of the continent, then this coming week at Xtremo6000 adventure race (daily “live” reports coming on SleepMonsters, if you are interested). It was a sad goodbye to everyone this morning… I’ve shared so many laughs these last few weeks, both with Benja out at the faro, and with the whole family, Pato and Ángela and their sons and all of their many friends. It’s tough when you have such good friends who live so far away… and you just never know if or when you will ever see them again. OK, please check back over the coming weeks… for more about the faro, about our hike, about some amazing swimmers, about Andean condors, about Buenos Aires tango, about adventure racing…. lots coming. ← Recycling is evil; pass it on.